WASHINGTON ― Two U.S. airmen suffered “minor” injuries as a result of the use of the Pentagon believes are Chinese-deployed lasers in Djibouti, the Defense Department’s chief spokeswoman said Thursday. Dana White told reporters that the U.S. has formally lodged a diplomatic complaint, known as a demarche, with the Chinese government, requesting an investigation into the incident. Maj. Sheryll Klinke, a Pentagon spokeswoman, confirmed to reporters after the briefing that the injuries were the result of one incident, in which two pilots of a C-130 aircraft were hit by a “military grade” laser. The pilots are not expected to suffer any long-term effects, Klinke said. White did not have an exact number for how many incidents there had been, putting it between two and 10, all within the last few weeks. News of the injuries was first reported by the Wall Street Journal. She did, however, indicate there were similar incidents in the past, where the U.S. did not take the formal step of issuing a diplomatic complaint. The decision to do so now was the result of “both” the injuries and the increased rate of incidents, White said. But the U.S. has been bracing for issues in Djibouti ever since China decided to open a military base just miles from Camp Lemonnier, currently the only permanent U.S. military base in Africa. China began construction of the base in March 2016 after it secured a 10-year lease for the facility. 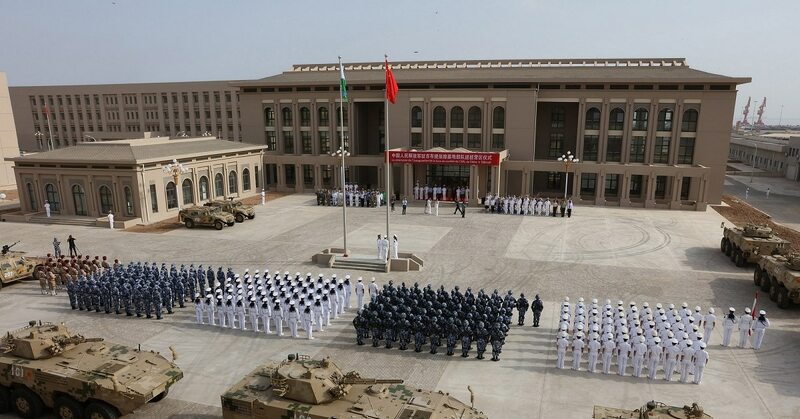 China has described the facility as a logistics-support base for ship resupply, as well as a hub for peacekeeping and humanitarian missions in the Gulf of Aden and Arabian Sea. But analysts who have studied open-source imagery of the base have instead described it as a fortress that will allow China to have significant influence in Africa.